Over the last 8 years, we have had the privilege of getting to know Chet Cannon, he has performed 5x at the San Felipe Blues & Arts, as well as two Blues Against Hunger food drives. He is a true to heart blues disciple and loves San Felipe. He is scheduled to perform again in San Felipe this weekend at a ticketed event. 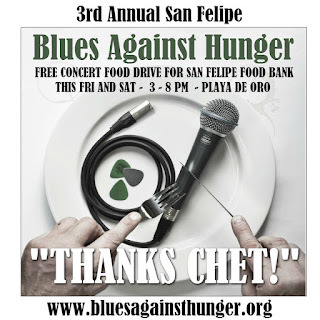 In a discussion with Chet about the upcoming event, we told him that we would not be having a Blues Against Hunger in San Felipe this season because of our schedule. Chet said he wasn't sure whether he would be able to return to San Felipe this season again, and suggested we make his event into a Blues Against Hunger. That was a simple decision to make. 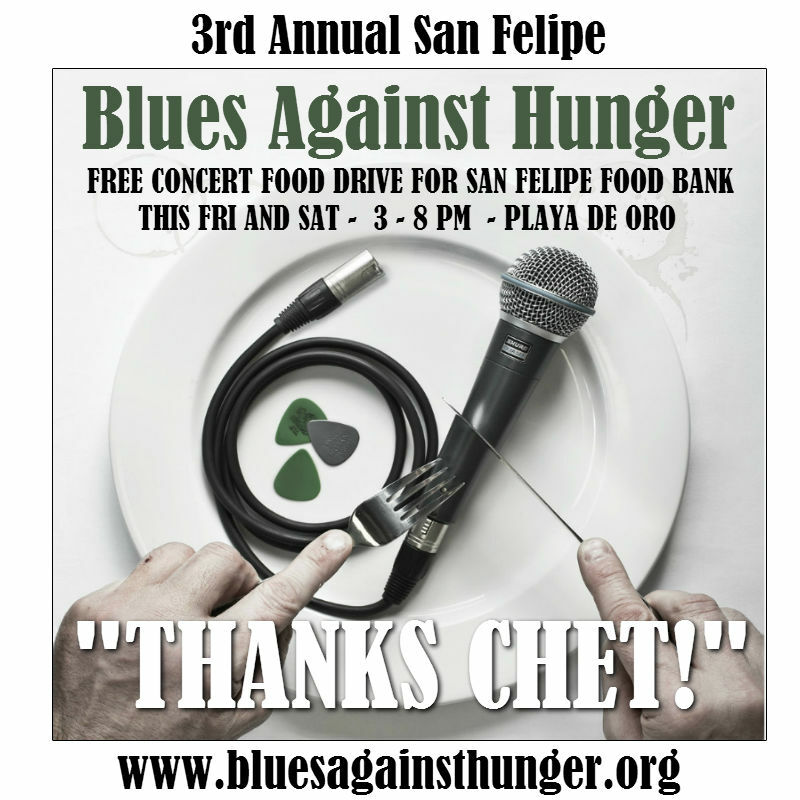 This weekend with Chet Cannon at the Playa de Oro Restaurant is now a Blues Against Hunger food drive for the San Felipe Food Bank. The event is now free to attend with a donation of any non-perishable, non-expired food item; such as canned goods, rice, beans, etc. For the last 3 years up and down the west coast from Cabo San Lucas, BCS, Mexico to Medford, Oregon the Blues Against Hunger events has raised thousands of pounds in food and fed hundreds of hungry people, all while sharing blues old and new with incredible bands and musicians. Please join us for Blues Against Hunger this weekend at the Playa de Oro Restaurant (formerly known as Margarita House), admission is free with donation. The restaurant will be serving beer, wine and spirits, and serving pulled pork sandwiches, and BBQ chicken sandwiches with homemade coleslaw, baked beans and bread. The doors will open at 3PM, food and bar service all afternoon. Music begins at approx. 4PM. Table reservations are available at the Baja Good Life Club office, or at www.bglclub.com. MUSICIANS: If you are a musician and love to play the blues, you are invited to join the jam. As a performing musicians your food and drinks are compliments of the Blues Against Hunger Society. Email help@bluesagainsthunger.org, or find us on Facebook "Blues Against Hunger". Let us know you would like to jam with us. We will announce all performing bands and musicians as they are confirmed.